I'm not a big fan of cold weather, and I'm dreading it as the summer is coming to an end. Although I don't like those few chilly months that we have in South Carolina, there is one thing that I do like about them: soup. I love making it and I love eating it. 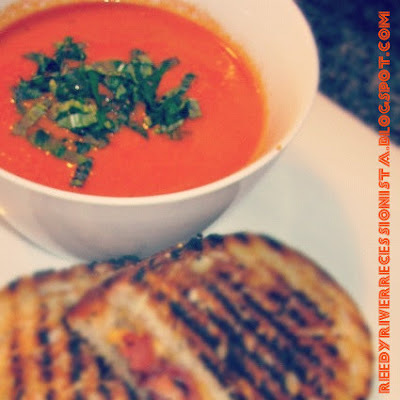 I made my first soup of the season this week and it's one of my absolute favorites, Creamy Tomato Soup. Once you try it you'll never go back to Campbell's. Its simple to make, pretty inexpensive, and it tastes phenomenal. Saute diced onion in 2 Tbsp. hot oil in a large stock pot or Dutch oven over medium low heat 8 minutes or until tender; add minced garlic, and saute 1 minute. Increase heat to medium high; stir in chopped tomatoes and chicken broth, and bring mixture to a boil. Simmer, stirring often, 10 minutes. Remove pan from heat. Allow tomato mixture to cool 10 minutes; stir in Brie pieces until melted. Process soup with immersion blender until smooth. Cook soup over medium low heat until thoroughly heated. Stir in salt, pepper, and if desired, garnish with a fresh basil chiffonade. I made grilled cheeses with bacon to go along with our soup. Perfect for dipping. Do you have any soup recipes you'd like to share? I'd love to add more recipes to my collection! I'd love to make this, but don't have an immersion blender :( Could I do it in a regular blender, or is there another way to make it w/out blending? I'm excited to try this recipe. My son and I both really like tomato soup. I am looking forward to trying this recipe. I just pinned it.